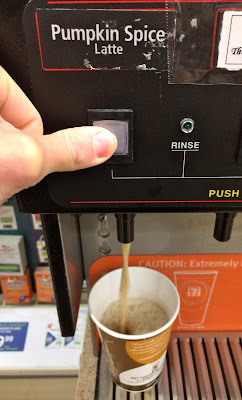 You knew this was coming...a pumpkin spice latte post! So I know pumpkin spice lattes aren't technically a candy but you need this information. 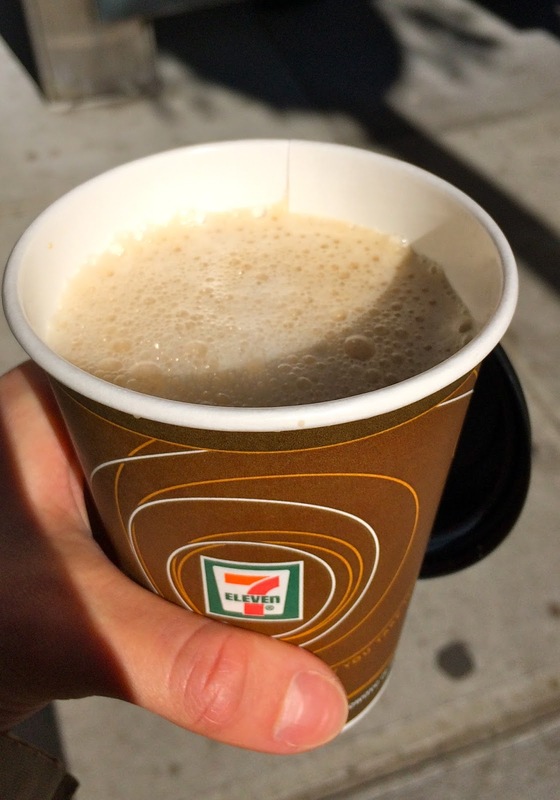 PSL's are ubiquitous this fall, they're everywhere, and people either love them or hate them. They're a very polarizing beverage. For the people who love them, I feel compelled to pass on my knowledge. Like a PSL PSA. First, let me start by telling you that I have loved pumpkin flavored everything long before it was trendy. Long before there was a "PSL" I was consuming pumpkin bread, pumpkin muffins, pumpkin coffee, pumpkin creamer, pumpkin ice cream, pumpkin candy, anything that had a pumpkin flavor. Because, if you recall, there once was a time when pumpkin flavored everything was uncommon and scarce. Now that the rest of America is on board with the pumpkin obsession, I am delighted to try even MORE pumpkin themed consumables. You thought I would get burnt out on pumpkin, huh? Not even close, I even sprinkle pumpkin pie spice in my morning coffee this time of year. I mean, I take it too far, not far enough! 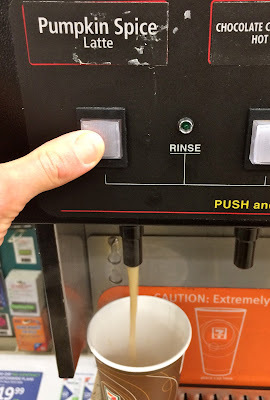 Just step right up and press the button! This PSL is way better than anything you've tried at another coffee house. 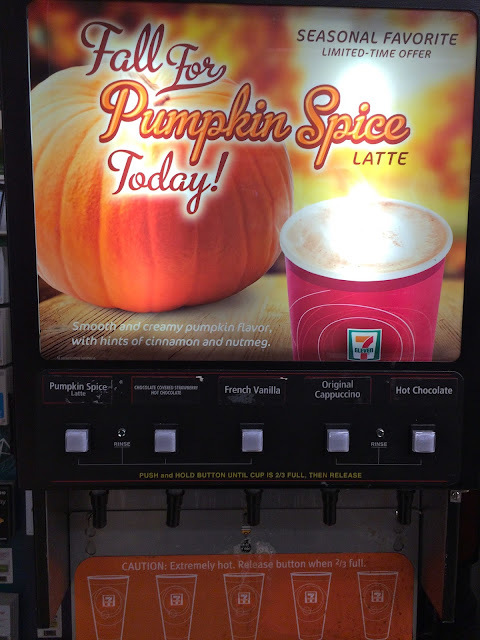 Including the one at Starbucks, even the newly updated Starbucks version that has actual pumpkin in it. Why you ask? What's in the 7-11 version? Who knows! But it is DELICIOUS. It tastes sweet and milky and pumpkin pie-y with the perfect balance of spices. It's like a slice of pumpkin pie (with whipped cream!) has been blended right into your coffee. You gotta go out and try one. Everyone who has taken this advice has ended up a believer (although, admittedly, they were all incredulous and a little scared at first). Look, worst case scenario you don't agree with me and then you're only out like, a buck. But, best case scenario/more likely scenario, you try it and love it AND it was only a buck! You're welcome. Please go out and try one and tell me what you think in the comments below or tag me on Instagram @thecandyquestblog. Hiii!!! I love 7/11 pumpkin spice lattes, too! I discovered them when I first moved to Chicago and was broke. Miss you!